Every year summer seems to be the most dreaded quarter for most hoteliers. With summer temperature at the peak and vacations across the country, business seem to slow down. Generally city hotels face a visible slowdown in summer every year in India. 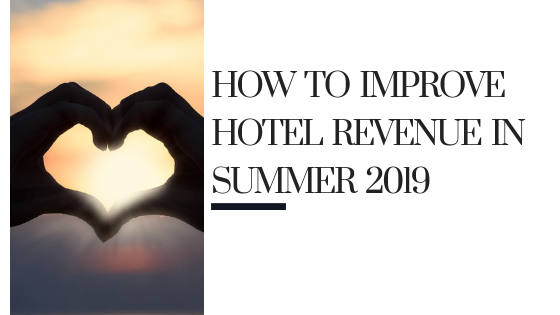 So how can you improve hotel revenue in summer this year? If you think that is a very strange advice for a post which talks about improving revenue for the summer, hold on. Let me explain. While the operation is busy, everyone is running around, doing what they need to do. However when you have a little bit of lean time, use the time to plan for the upcoming year. Spend some time with the leadership team to understand what changed in the market and what you can do to about it. Take the team out for 2 to 3 days to plan for the remaining part of the year, make a marketing plan and reset the focus. Click here to buy a template. #2. Spruce up the hotel. Summer is time for spring cleaning in Indian hotels. Use the down time to factor in deep cleaning and renewed focus on the product upkeep. Your hotel must have taken a beating between November to March with busy season and activities. Use the down time to do a complete maintenance of the hotel so that you can have a fresh product to show and welcome guest with. Your ability to demand rates will be higher if your property is well maintained. Revisit your property improvement plan and work on a few areas that you can relaunch as part of a PR story when business is picking up. #3. Prospect and close residential groups to build base business. If you know your base expenses, prospect and close residential groups to build a base to cover at-least basic expenses like electricity or payroll cost. While summer groups may come in at a slightly lower ARR, it does help you keep the lights on and make sure you don’t dip into a operating loss. Summer is a time to use the fresh produce available in the market. Create seasonal promotions and food festival to create a buzz around the restaurants in the hotel. If you have the resources, engage with some visiting chef to curate a food festival and increase the visibility for the hotel. Unique food festival ideas can help you to improve revenue in the restaurant. Another area that you can focus on is the swimming pool. With many children wanting to learn to swim, the pool offers and additional source of income. However make sure you partner with a professional trainer to do that so that the place is safe for children to use. #5. Plan sales calls to important clients. While sales calls are a year round activity, take time to meet all your important clients and talk about your plans for the future. All the things you did to spruce up your hotel should help to reestablish confidence in your product. Also while you go on sales call, fix appointments to your dream companies that you have been trying to visit and prospect for a while. Host an evening for special guests to thank them for the business and ask for future business.